Stevens Point is a perfect place for taking in the arts. Take your special someone to the Scarabocchio Art Museum, the Stevens Point Sculpture Park or the Riverfront Arts Center. There are many beautiful places to take a stroll in Stevens Point. Iverson Park is in one of Stevens Point’s oldest parks and is a great place for walking and birdwatching. The Schmeekle Reserve is another ideal spot for enjoying nature. Also be sure to check out the Green Circle Trail, a wonderful 26-mile trail that rings Stevens Point. Stevens Point is a perfect place for a night on the town. Enjoy a candlelight dinner or tuck into a supper club for a timeless Wisconsin evening. Stevens Point’s downtown is the perfect place to take a romantic stroll at the end of the night. Get some delicious dining ideas here. 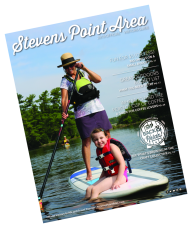 Plan your next Stevens Point getaway. Get more ideas, including lodging information, here.